Bulk Savings Available Buy 4 or more for Best Pricing! Nutrex Hawaiian Spirulina Pacifica Supports Eye Health, Immune Function, Healthy Cholesterol Levels, Cellular Health and Increases Energy. The levels of key nutrients in our Spirulina are much higher than in any competing product. Best By date is 10/2021. As the growers of Hawaiian Spirulina, we focus on ways to protect the superb antioxidant quality through all phases of production. Our facility uses ocean water drawn from a pipeline that plunges 2000 feet into the Pacific Ocean. BETTER THAN ORGANIC – Spirulina is grown in water. Hawaiian grown spirulina uses vegan mined nitrates & no pesticides, herbicides, or GMO’s, producing clean, high-quality spirulina. BOOSTS ENERGY & IMMUNITY – Give your body what is craves. Bundle of 3 BOTTLES - Buy 4 bundles for max savings! Condition is New. Hawaiian Spirulina is all natural and 100% vegan, non-GMO, and free of lactose, soy, pesticides, herbicides, and solvents. Certified Gluten-free and Kosher. Nutritional Highlights of Spirulina. Grown in a Biosecure Zone, our Spirulina is free of pesticides, herbicides and GMO's. 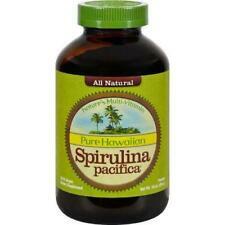 Hawaiian Spirulina. Features of the Nutrex KH-1003 Product. Hours of operation our professional staff is ready to help you. Each pond is fed with 100% potable drinking water from Hawaiian aquifers and blended with pure deep ocean water to bring in beneficial trace minerals. Hawaii is an ideal location to grow spirulina, which allows our spirulina to be grown year-round. Pure Hawaiian Spirulina Powder 16 oz – Boosts Energy and Supports Immunity – Vegan, Non GMO – Natural Superfood Grown in Hawaii. 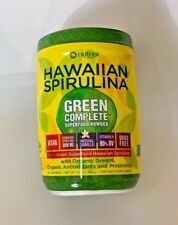 Hawaiian Spirulina is a blue-green microalgae, Arthrospira platenesis, which is grown naturally under the intense Hawaiian sun on the Big Island of Hawaii. 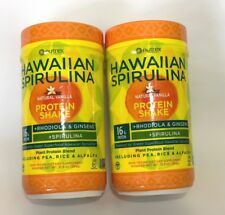 Nutrex Hawaii - Pure Hawaiian Spirulina Powder - 5 oz. Nutrex, Inc. All natural hawaiian spirulina. Riboflavin 120 mcg. Enjoy mixed in juice, fruit smoothies, or sprinkled on food. Refrigerate after opening. Gamma linoleic acid (GLA) 28 mg. Thiamin 90 mcg. Pesticide free/Herbicide free/Kosher Hawaiian Spirulina Pacifica is the finest, most nutrient rich Spirulina in the world. The levels of key nutrients in our Spirulina are much higher than in any competing product. Pure Hawaiian Spirulina Powder 5 oz – Boosts Energy and Supports Immunity – VegaFlavor:Powder | Size:5oz powder All Natural Hawaiian Spirulina Pacifica is a pure natural super greenfood, containing protein, betacarotene, and essential vitamins & minerals. Doctors and scientists recommend that we eat 9 servings of fruits and vegetables per day. For most people, this rarely happens. Thatâ€™s one reason why you should take Hawaiian Spirulina every day. Spirulina is a â€œSuperfood.â€ It is the most nutritious, concentrated whole food known to humankind. Pesticide free/Herbicide free/Kosher Hawaiian Spirulina Pacifica is the finest most nutrient rich Spirulina in the world. The levels of key nutrients in our Spirulina are much higher than in any competing product. A source of health-promoting antioxidants, vitamins and minerals. 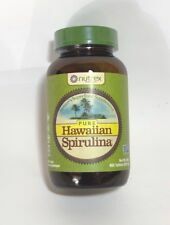 Ingredients : Pure Hawaiian Spirulina (Arthrospira Platensis). Enjoy mixed in juice, fruit smoothies, or sprinkled on food. Refrigerate after opening. EACH BOTTLE OF PURE HAWAIIAN SPIRULINA PACIFICA POWDER WEIGHS 5 OZ. Nutrex Hawaii Hawaiian Spirulina Pacifica Powder, 5 oz. These products are not intended to diagnose, treat, cure or prevent any disease.". Item Specifications. Spirulina Plant Protein Each serving is powered by one full 3 gram serving of Hawaiian Spirulina for a full 16 grams of vegan protein (from Hawaiian Spirulina, Pea, Rice and Alfalfa), plus energy boosters (Rhodiola Ginseng), a delicious creamy vanilla tasteHawaiian Spirulina Protein Shake is designed to help you play hard and recover fast and is recommended for any individual interested in maintaining overall health and supporting recovery from physical activityExcellent source of Vitamin B12, Vitamin K, Iron and supplies 32% recommended daily value of protein making it the superior choice for supplemental nutritionBoosts energy without the later caffeine crash - supports increased energy levels, recovery, and immunityHawaiian Spirulina Plant Protein is fr. NUTREX HAWAII 1x 5 OZ SPIRULINA POWDER. Hawaiian Spirulina is the world s most complete and powerful Superfood with an amazing diversity and potency of nutrients. Always check the actual product label in your possession for the most accurate ingredient information before use. 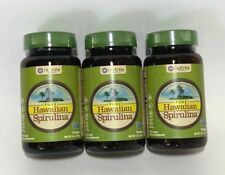 Hawaiian Spirulina is a blue-green microalgae, Arthrospira platenesis, which is grown naturally under the intense Hawaiian sun on the Big Island of Hawaii. It naturally contains protein, iron, beta carotene, minerals, vitamin B12, zeaxanthin, chlorophyll, and phycocyanin. Spirulina strengthens the immune system and supports cardiovascular health. Our spirulina is grown on the sunny coast of Kona, Hawaii in fresh Hawaiian aquifer water without using pesticides or herbicides. 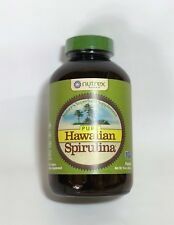 Pure hawaiian spirulina pacifica powder is a natural dietary supplement formulated to support a healthy immune system.Made with natural ingredients this supplement is pure and free of unnatural and unnecessary additives.This product is gluten-free vegan friendly and does not contain lactose or yeast.Each bottle of pure hawaiian spirulina pacifica powder weighs 5 oz. Spirulina provides a wide range of delicate phytonutrients with very significant health benefits. These phytonutrients include antioxidants known for giving fruits and vegetables their orange and yellow colors. © 2016 etailz, Inc. Free of pesticides, herbicides, gluten and lactose. Grown in a Biosecure Zone. Non-GMO Project Verified. 100% Vegan. Servings Per Container: 47. Key Features. Ingredients : arthrospira platensis;pure spirulina. size : 5 oz. is gluten free : yes. Bundle of 2 - Buy 4 bundles or more for Best Pricing! Flavor:Powder | Size:16oz powder Hawaiian Spirulina is a blue-green microalgae, Arthrospira platenesis, which is grown naturally under the intense Hawaiian sun on the Big Island of Hawaii. It naturally contains protein, iron, beta carotene, minerals, vitamin B12, zeaxanthin, chlorophyll, and phycocyanin. Pure Hawaiian Spirulina Powder 16 oz - Boosts Energy and Supports Immunity - Vegan, Non GMO - Natural Superfood Grown in Hawaii. Flavor:Powder | Size:16 Ounce Hawaiian Spirulina is a blue-green microalgae, Arthrospira platenesis, which is grown naturally under the intense Hawaiian sun on the Big Island of Hawaii. Pure Hawaiian Spirulina Powder 16 oz – Boosts Energy and Supports Immunity – Vegan, Non GMO – Natural Superfood Grown in Hawaii. Flavor:Powder | Size:16oz powder Hawaiian Spirulina is a blue-green microalgae, Arthrospira platenesis, which is grown naturally under the intense Hawaiian sun on the Big Island of Hawaii.